A recent article claims that Pinterest Saved a Marriage. Jennifer Borget might be a great sewer, but she hates cleaning. Her husband does most of it — the dishes, vacuuming, laundry, bathrooms — and nags her to clean up her sewing and craft area. But she refused to be a “Stepford wife,” she says, until Pinterest inspired her to make cleaning crafty. She says Pinterest saved her marriage. Well, there was never a threat of divorce, but the couple now has fewer reasons to argue about keeping the house tidy, and they’re happier. I can definitely see how Pinterest could help her change her organization habits. There are tons of great ideas on there that are brilliant and simple. I’ve found recipes I love, ways to organize and even craft ideas for kids (maybe one day!). 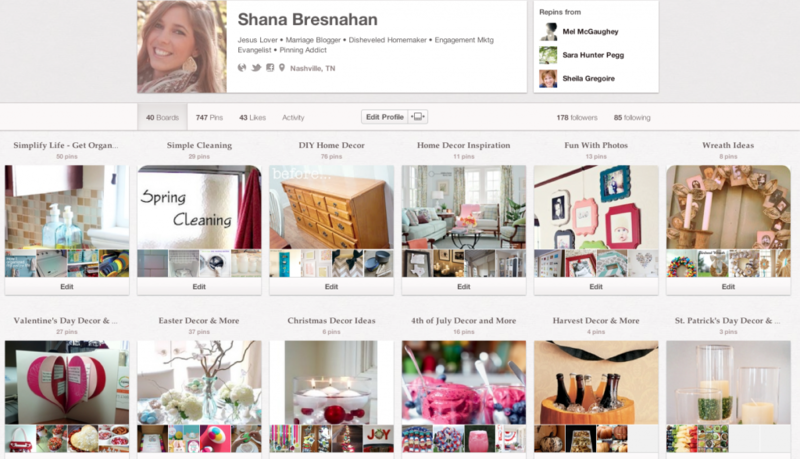 What good habits have you picked up from Pinterest? Not on Pinterest? I won’t guarantee it will save your marriage, but I will warn you that addiction happens fast! Need an invite? Put your email in a comment and I’ll send you one.